A truck with a mounted front-facing camera that shows activities on the other lane through rear screens is making waves in the trailer truck industry. The European Agency for Safety and Health at Work made an international study of road accidents and noted that a third of road accidents are work-related. Further, it stated that the larger the vehicle and the heavier its load, the more prone it is to accident. The same is true in Australia, which is why the new “transparent” truck is making waves down under. The innovation was created by Samsung and Leo Burnett Argentina, which called it the Samsung Safety Truck. It has a forward-facing camera and rear-mounted television screens. Overtaking a trailer truck on a single lane can be difficult because one has to figure out if there’s a vehicle on the other lane. The camera will capture oncoming traffic for vehicles following the Samsung Safety Truck. The wide screens on the rear will reflect what the camera captures in real time. It’s called a “transparent” truck because it looks like one because of the screen display. According to an Australian transport agency, heavy trucks are involved in 20 percent of the accidents on Australian roads. Of this percentage, 33 percent end in death while six percent of teens and the younger generation are said to have been injured in the road accidents. The Samsung Safety Truck was created by the company based in Argentina where over 5,000 road deaths were recorded in 2014. A lot of the deaths were supposedly from vehicles overtaking semi-trailers on highways. “This allows drivers to have a better view when deciding whether it is safe to overtake. 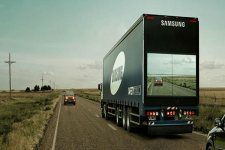 Another advantage of the Safety Truck is that it may reduce the risk of accidents caused by sudden braking or animals crossing the road,” Samsung described its innovation in its blog. The truck, through Leo Burnett Argentina, received Adweek’s Gravity Award, the highest honor in the Project Isaac contest. The project also hauled awards, including the highest award—Cyber Lion, in Cannes.